Rooney Mara attended the Art Of Elysium ‘Heaven’ Gala on Saturday (January 5) in Los Angeles, California, joining Lily Collins. The actress wore a Hiraeth Spring 2019 ensemble, which is her ethical vegan fashion brand. Many were probably surprised by the sweeter sentiment the white coordinates evoked given her penchant for sharp lines and dark elegance. And the surprise likely increased when they found out it’s her line. That’s not to say it’s completely out of character. 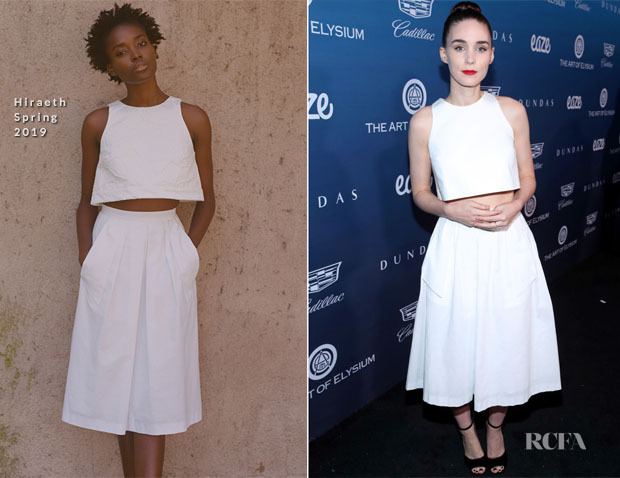 The optic white colour and sharp crop top are in line with her signature style. The overall look presents a sophisticated minimalism that makes me intrigued to see more of the collection and from her.